Is Christmas sangria a thing? It should be. Here's how to make it without a recipe in four simple steps. Is Christmas sangria a thing? It should be. Sangria is one of the few mixed drinks that's easier and often better to make without a recipe. On Christmas morning, just combine a few ingredients that you have on hand and you'll produce something delicious that you can sip all day. Here's the 4-step procedure. 1. Choose your wine. Almost all whites and rosés work beautifully. Off-dry Riesling is especially nice, as it provides a bit of built-in sweetness. Prosecco and other sparkling wines are fantastic as well. If you're using a red wine, the main one to avoid is Cabernet Sauvignon because tannins can taste chalky and weird at cooler temperatures. Low-tannin reds like Beaujolais and Zinfandel are great. Pour a bottle or more into a pitcher or a punch bowl. 2. Add fruit. Some kind of citrus is essential, but anything is fair game. Apples, pears and cranberries are good wintery choices. Cut them up and toss them in. 3. Spike it. Brandy is the traditional choice here, though fortified wines like ruby port and liqueurs like Cointreau are also excellent. Sake can work. Bourbon can work. If in doubt, mix a micro-batch together in a glass and taste before pouring it into the whole batch. For every bottle of wine you're using, add about 1/2-cup of something stronger. 4. Spice and sweeten. 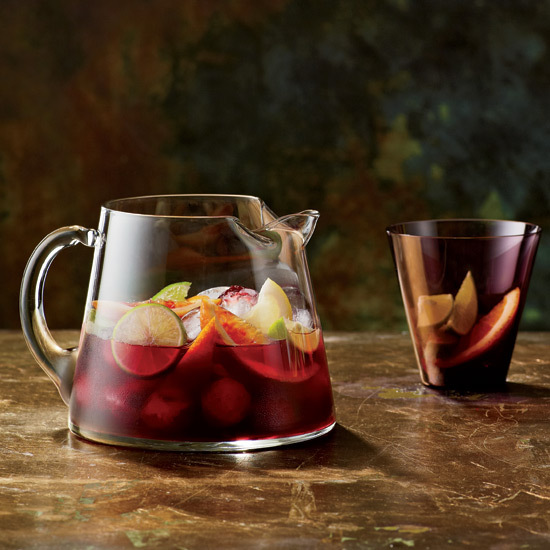 What makes Christmas sangria different from all other sangrias? This step. Mix a cup of water and a cup of sugar in a saucepan, and then add whatever smells good from your spice rack: cinnamon sticks, nutmeg, allspice, cloves, maybe a pinch of crushed red pepper. Herbs like thyme and rosemary work too (but go easy). Simmer for 10 or 15 minutes over low heat, stirring occasionally, then strain. Use the spiced syrup to sweeten your sangria to taste. Put this in the fridge for an hour or so, then pour over ice and enjoy. Repeat as necessary.